It’s not easy to engage and challenge percussion students in school band class. Just having them play the method book snare drum part – especially during those first months of classes – won’t do it. Having them work on the snare and mallet exercises in a method book helps a little but, compared to the other instrumentalists in the class, there’s still not much for them to do. Dropping a stick onto a drum to play a quarter note doesn’t challenge percussion students (consider what a trumpeter has to learn just to play a note!). Playing nothing more than quarter notes and half notes for 20 or so lessons doesn’t lead to percussion students being engaged and happy. Not to mention that they just don’t learn much in the process. But there are things band directors can do to spark their interest, and develop their technique and musicality. 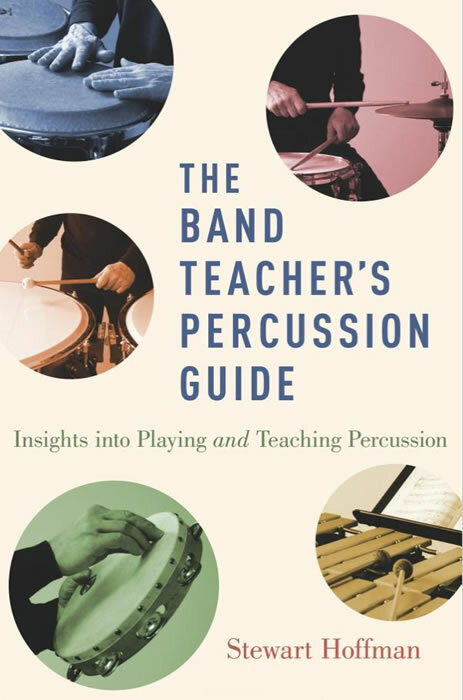 In my book, The Band Teacher’s Percussion Guide: Insights into Playing and Teaching Percussion (Oxford University Press), I discuss a number of possibilities. I’ll point out a couple here, and add some snare drum sticking patterns that will help engage and challenge percussion students as well as improve their technique. First of all, beginning concert band class provides a great opportunity to relentlessly keep an eye on your percussionists’ technique. It’s easy just allow them to bang out notes while ignoring how they are playing the drum. If you can get your percussion students to focus on playing with good form and a relaxed stroke now – when they are forced to play slowly – they will be better prepared for technical challenges that come later on. Secondly, try having them play the exercises on instruments other than the snare drum. They will start thinking about the different sounds they can produce and how best to produce them. Playing on instruments that sustain sounds, like cymbals, will help them understand the true length of the quarter and half notes that are notated. play the snare parts in the method book on tambourine, triangle, bass drum or suspended or crash cymbals. If the instrument rings, teach them how to dampen so that it sustains for the correct time value. play on two tom toms. Using alternate sticking, they can play each bar moving between tom toms, or; they can play one bar with the right hand only and the following bar with the left, or; they can play the right hand on one tom and the left hand on the other. Percussionists must focus on new rudiments, buzzes and rolls as they are introduced in the method book. It’s just not enough that they are played once or twice at a slow tempo in the course of a band exercise. To challenge percussion students and guide them toward a more solid technique, make sure they practise buzzing and buzz exercises, rolls and rudiments on their own. They should practise them very slowly at first, but more and more quickly over months – and even years – always focusing on playing evenly and with a relaxed technique. Assign rudiments and rolls with appropriately challenging metronome marks as goals. Include them as a component of their play tests. You’ll need to supplement the method book with other material too. You will find lots of basic flam, paradiddle and buzz exercises that can be downloaded for your students at the Percussion Guide’s Companion Website, but you can also try these Practise and Warmup Snare Drum Sticking Patterns, which I’ve based on George Lawrence Stone’s Stick Control, a classic book for developing snare drum technique. Students should play the quarter, eighth or sixteenth note exercises (depending on their technical level) in place of the snare drum material written in whatever method book exercise you are playing with the rest of the band. Playing these exercises evenly and without any accents will help your percussionists develop concentration, a good sense of time, and the ability to place notes right with the beat. Playing from the method book alone does not challenge percussion students in a school band program. By adding a few of the suggestions and exercises above to the daily routine, you will help do so. At the same time, you’ll guide them to a stronger technique and better musicianship.